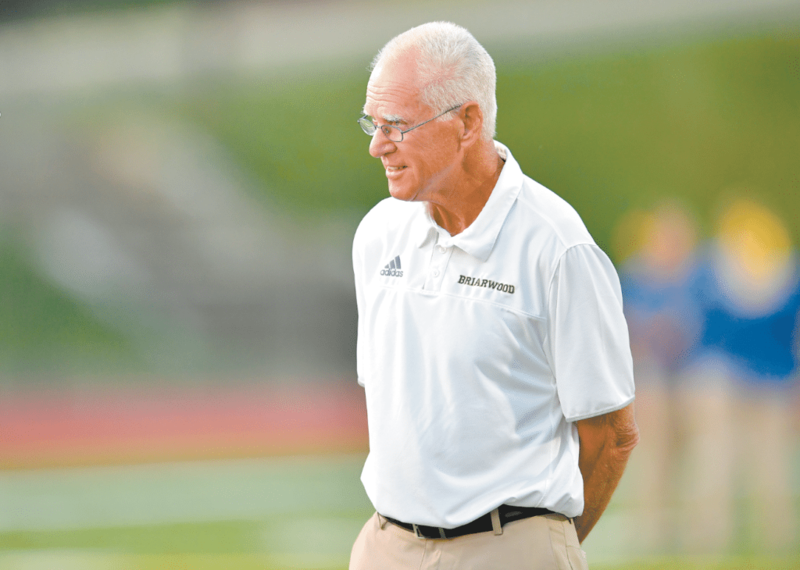 As his team continues what they hope will be a march toward a fourth state championship under Yancey’s watch, which would be the school’s sixth championship in total, it’s a bigger picture that still drives Yancey. Journal photo by Lee Walls Jr.
Briarwood Christian School football coach Fred Yancey inked his name in the record books last month when he scored his 300th victory as a high school coach with a 23-6 win at Fairfield. The Sept. 22 win, Yancey’s 259th in the state of Alabama, ranks him fifth among active coaches for victories in the Alabama High School Athletics Association. But Yancey’s path to the record books was not a linear one. He began his career at Towering Oaks School in Memphis, where he served as the head coach for three years, and he moved on to Gatewood School in Eatonton, Georgia, for three more. He then chose an unusual path for a coach who has compiled an accomplished resume; he stepped back into an athletics director role for nine years, serving as the coach for the freshman team. Those were victories not counted in his record. Now the Memphis native trails only four coaches – Buddy Anderson at Vestavia Hills, Danny Horn at Benjamin Russell, Terry Curtis at UMS-Wright and Dale Pruitt at Albertville. – for wins by active coaches in the AHSAA. He remembers the first win in Memphis as vividly as the 300th one. Over the years, Yancey has trained athletes who have gone on to play at higher levels. Former Alabama stand- outs Tim and Simeon Castille were high school All-Americans for Yancey at Briarwood Christian before spending some time in the NFL. Andy Davis and Yancey’s son Bart each enjoyed success at Samford. Former Auburn offensive lineman Andrew McCain honed his skills on one of Yancey’s teams. Walker May served as a captain at Vanderbilt. Before he became the offensive coordinator at SMU, Joe Craddock played quarterback for Yancey; and before he spent time on the staffs of the St. Louis Rams and now at North Carolina, for- mer Auburn quarterback Barrett Trotter played the position at Briarwood. The latter two still lean on their high school coach for advice, however modest he may be about the relationship that they maintain. Technology is the thing that’s changed the most in 40 years, he said. The people haven’t. His faith remains his priority. It’s what he followed across the Deep South to connect with his family and football for 40 years. As his team continues what they hope will be a march toward a fourth state championship under Yancey’s watch, which would be the school’s sixth championship in total, it’s a bigger picture that still drives Yancey. “The Lord’s in control and he has a great plan for each and every one of us,” he said. “I think football is the way that He allows a lot of our boys to grow up. Football isn’t the only way for a young man to grow up; but it’s a great way.